Our kitchen remodel – week #6 – It’s done! The kitchen is finished … mostly! The counter-depth fridge is backordered … and should arrive in a couple of weeks. The gist of this week was all the really fun stuff … getting the kitchen sink hooked up … thank you Jesus … and finishing up electrical with under-cabinet lighting. It is going to take me a couple of weeks to figure out which button turns on which light. Appliances were also delivered and installed. Who gets this excited about a warming drawer? We now have pendant lighting above the island, light fixture above breakfast table and hardware on the cabinets. After that … some paint touchup and cleanup and it was a magical moment … we have our house back! First recipe cooked in the new oven … a couple loaves of pumpkin bread! Jerry at Finishing Touches has a great crew of craftsmen and suppliers. I also enjoyed working with Anne Crawford, an awesome kitchen designer, who made us feel confident about our color choices and the Charley Harper art tile possibilities. Tomorrow I will be performing some serious baking duties for our upcoming Thanksgiving feast! We have so much to be thankful for! Bacon and eggs for breakfast! I have a guest contributor for this week’s blog post. Aleta is my lovely daughter-in-law’s mother and readily confesses that her “happy place” is the kitchen. I adore her like a sister and not just because she cooks and bakes well! We spent the last week of 2015 happily hanging out with family at a beach house in Galveston playing board games, cooking, fishing and exploring The Strand in Galveston. This particular recipe is adapted from Tasty, a page on Facebook that does all those clever food videos. It seems to be a recent phenomena like Tip Hero and Cooking Panda. Just “like” their Facebook page and all kinds of easy recipes magically pop into your newsfeed. The heavily edited videos are short and often feature an empty bowl, ingredients being pored into it, stirred around, manipulated further and then the end result. Just share the video and you can view it on your page forevermore and watch it over and over! Lately many of the videos seem to be featuring canned pizza dough as the main ingredient. I suspect a clever marketing ploy by the Pillsbury people. Consider me hooked! I’ve already made the pretzel pigs in a blanket, and my personal favorite, a ham and swiss rollup recipe with poppy seeds that were crowd pleasers! With a jar or cookie cutter, cut 2 circles into each piece of bread. Place in greased muffin tin cups. 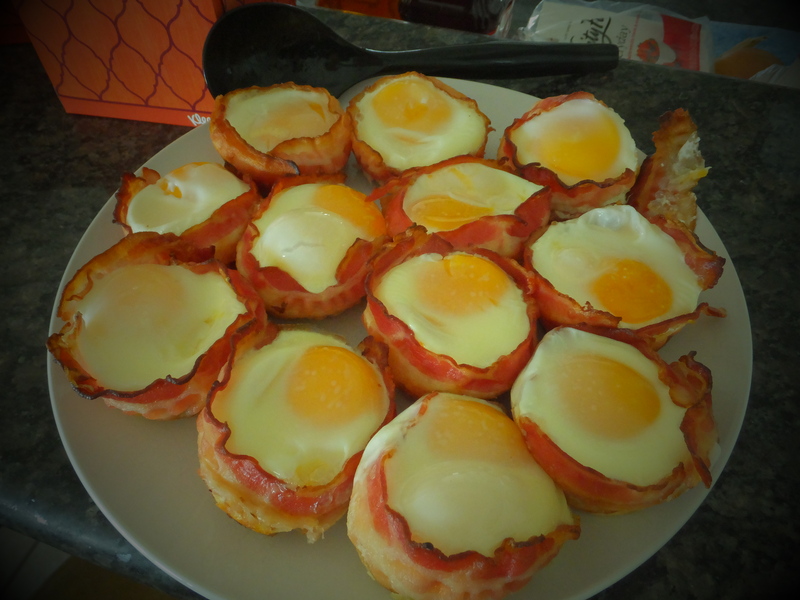 Wrap a piece of pre-cooked bacon along the edge of each muffin cup. Sprinkle 1/2 tablespoon cheese into each cup and then top with an egg. Season with salt and pepper and bake at 400 degrees F/204 degrees C for 15 minutes (longer for firmer yolk). Top with green onion. So we hadn’t been back to New Orleans for a couple of years and have just recently returned from a quick weekend visit. While New Orleans is mostly about the food, there is lots of shopping, people watching, wedding parties strolling down the Quarter, street music and atmosphere to be enjoyed. We stayed at our favorite Hotel Monteleone located in the French Quarter on Royal Street. The location is great for accessing shopping and restaurants. We also visited Harrah’s Casino, which is much nicer now that it is a non-smoking casino. Yes … I said non-smoking! I learned lots watching hubby play craps and perhaps next time I might even be persuaded to join him at the pass line to throw the dice! BREAKFAST OPTIONS – We had some interesting restaurant experiences that I just have to share. Breakfast is my favorite meal of the day, especially when I don’t have to conjure it up. Be sure and check out the Ruby Slipper Café located at 200 Magazine Street, just outside the Quarter. It was recommended by several FaceBook friends and I can see why. The café has several locations and open seven days a week. Their motto is “there is no place like home” and it shows. The staff are the friendliest we encountered during our visit. Hubby had the Eggs Blackstone, which is two perfectly poached eggs over bacon, grilled tomato and open-faced buttermilk biscuit finished with hollandaise sauce and served with breakfast potatoes. Yum! We also had an interesting breakfast after attending Mass at St. Louis Cathedral on Sunday. I had noticed The Grill, 540 Chartres Street, as we walked past it from our hotel. It certainly meets all the criteria of a “dive,” but from the window, had a healthy number of people with smiles on their faces. After Mass, we entered into a world fresh out of the past. The interesting counter configuration with seating stools looked ancient like something out of the 1950’s, or older. I couldn’t help but notice most everyone had an omelet on their plate. OMG … best omelet ever! I had the Vegetable Omelette with delish grits! Eggs were light and fluffy and with over 10 different kinds on the menu how can you go wrong. OTHER DINING OPTIONS – Dinner in New Orleans is a bit of a challenge, unless you dine at a place that accepts reservations. Wanting to be spontaneous is not recommended. That being said, we had a lovely dinner at King Fish on Chartres Street. They have an interesting menu (crab lollipop appetizer was a huge hit) and the service was great. We also stopped into Kubi’s Bar & Café located at 109 Tchoupitoulas on our way to Harrah’s. Now while I’d definitely call it a dive, hubby and I shared an excellent burger, the Kentucky, brushed with BBQ sauce, topped with bacon, cheese and fried onion rings. Our worst meal was at the Gumbo Shop on St. Peter Street. The line was long, the service too fast, and the food … put fast food to shame. We talked about getting bread pudding for dessert, but skipped it because the food was so bland and well, old-looking. We won’t be going back. A LITTLE SHOPPING – Laura’s Candies has two locations in the French Quarter and has been around since 1913. We couldn’t resist the pralines and promised to come back for more. Unfortunately, we ran out of time! One regret I had two years ago was not making time to check out The Quarter Stitch, a needlepoint and yarn shop, on Chartres Street right down the street from Jackson Square. The place has been open for 43 years and the ladies are so nice. They offered to teach me how to needlepoint, but I declined. These eyes are too old. They have amazing canvases all ready to needlepoint. I lingered through their lovely yarn and chose two skeins of ruby red Merino Superwash made in Peru. Bonus … PJ’s Coffee Shop is right across the street. Hubby had the best time hanging out there while I yarn shopped! I already can’t wait to go back! We are really missing our Blue Bell Ice Cream at our house. I don’t know how much longer we can go without our favorite Blue Bell flavors like The Great Divide, plain old fantastic Homemade Vanilla and, my personal favorite, the one that combines vanilla ice cream and orange sherbet … drool. Feeling kinda helpless, we decided to do our part to support Blue Bell Ice Cream in their time of need. I mean … we can’t afford to take out a whole page newspaper ad like Gallery Furniture … which was major cool. 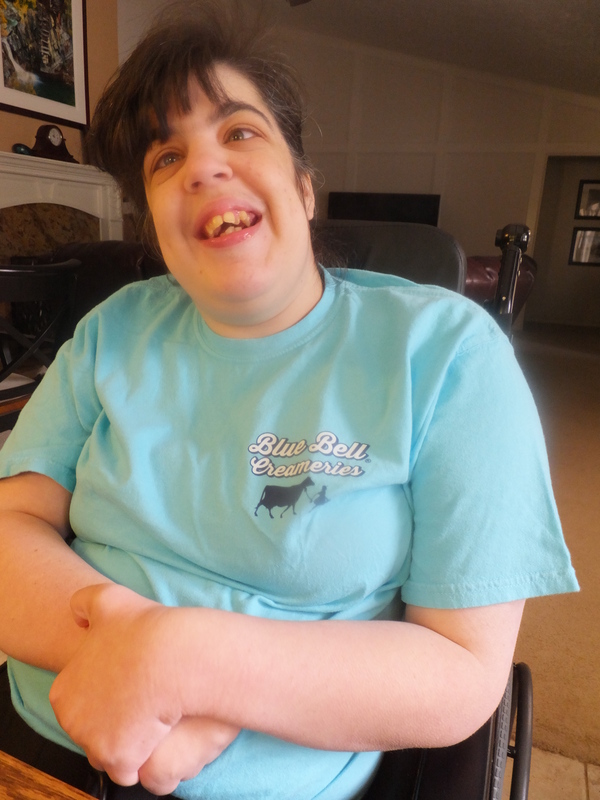 So instead I purchased a couple of super cute t-shirts for our special needs daughter, Mimi, off of Blue Bell’s website. They came in the mail in just a couple of days. How much are you missing Blue Bell Ice Cream right now? Just after Easter, I spent several days relaxing in Navarre, Florida on white sandy beaches. Located in the Florida panhandle, we stayed at The Pearl of Navarre Beach. Google the condo name and you will find several ways to rent one of their condos. Every morning someone puts out all the beach chairs/umbrellas for their guests. The water consists of lots of shades of blue … and the sand it was fluffy and white … a great combination! We did lots of relaxing, walks on the beach, playing board games and even learned to play Texas Holdem. I’ve seriously gotta learn to bluff! The boys did lots of fishing. With options like pier fishing, surf fishing and charter fishing there are choices to be made! One afternoon hubby and I ventured out for lunch. I highly recommend The Slippery Mermaid for sushi! With items on the menu like Sassy Mermaid and Funky Mermaid how can you go wrong? I gotta give photo credit to Kate’s awesome mom, Aleta. She took nearly all the photographs. Lobster risotto … need I say more? Did you notice that all the retail establishments are decorated for Valentine’s Day? It made me think about what I could make this year. My favorite go-to fancy recipe is Lobster Risotto. Found it in a book published several years ago by Williams-Sonoma called Wine & Food a New Look at Flavor. Thought I’d share! Time saving hint … shop for a lobster at a grocery store that will steam one as you shop. Saves lots of preparation time and there will be one less pot to clean. Pour the broth into a small saucepan, bring to a simmer over medium heat, and adjust the heat to keep the broth at a bare simmer. In a large deep skillet over medium-low heat, warm the oil. Add the onion and red pepper flakes and sauté until the onion is soft, about 3 to 4 minutes. Add the Arborio rice and cook, stirring to coat with the onion mixture, until the grains are opaque, about 2 minutes. Add the wine, lemon zest and juice, and saffron threads. Cook for 2 minutes. Begin adding the hot broth to the rice 1/2 cup at a time, stirring often and waiting until each addition is almost fully absorbed before adding more. After about 20 minutes, when you have added all but 1/2 cup of the broth, the mixture should look creamy. Taste a grain of rice. It should be cooked through but still slightly firm (not hard) at the center. If it is still too firm, add the remaining broth and continue cooking. When the rice is ready, stir in the lobster, distributing it evenly, and then stir in the tomato and butter. Let stand covered for 5 minutes before serving to heat through the lobster and tomato. Spoon the risotto into shallow bowls and serve right away. Makes 4 servings. If you have the chance to travel to Holland, don’t just hang out in Amsterdam! Add a few small towns on our travel agenda. We visited Delft and wished we had a full day to explore. The town is called the “City of Princes,” because of the shared past and present with the Dutch royal family. Because we visited Delft, the Kinderdijk and Haarlem the same day, we did not do the town of Delft justice. We did visit the Nieuwe Kerk, or New Church, built in the 1300’s, but did not make it to the Oude Kerk, or Old Church, a 5-minute walk away or the Delft Factory. Obviously, we spent too much time in the local cheese shop! Or perhaps it was the leisurely beer and crepe lunch?